With all hoopla about the Georgia Gorilla, all of us here wanted to remind our constant readers that you heard it here first -- way back on July 27th. The post was entitled "Bigfoot Capture?" 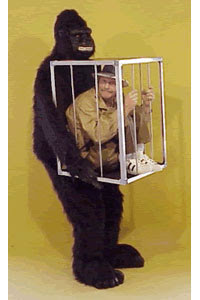 Ironically enough it had a picture of a guy in a gorilla suit. And as Co-Founder of the BfRLC, I just want to thank my great team for finding this story almost a month before the rest of the internet did. BfRLC team I salute you! A body that may very well be the body of the creature commonly known as “Bigfoot” has been found in the woods in northern Georgia. DNA evidence and photo evidence of the creature will be presented in a press conference on Friday, August 15th from 12 Noon to 1:00pm at the Cabana Hotel-Palo Alto at 4290 El Camino Real in Palo Alto, California, 94306. The press conference will not be open to the public. It will only be open to credentialed members of the press. *The creature is seven feet seven inches tall. *It weighs over five hundred pounds. *The creature looks like it is part human and part ape-like. *It has reddish hair and blackish-grey eyes. five toes on each foot. *The feet are flat and similar to human feet. *Its footprint is sixteen and three-quarters inches long and five and three-quarters inches wide at the heel. eleven and three-quarters inches long and six and one-quarter inches wide. *The teeth are more human-like than ape-like. *DNA tests are currently being done and the current DNA and photo evidence will be presented at the press conference on Friday, August 15th. Matthew Whitton and Rick Dyer will be flying in from Georgia to be at the press conference. Also present at the press conference will be Tom Biscardi, CEO of Searching for Bigfoot, Inc.
Whitton is a Clayton County, Georgia, police officer, who is currently on administrative leave after being wounded in the course of duty pursuing an alleged felon. Dyer is a former correctional officer. Whitton and Dyer are co-owners of bigfoottracker.com and Bigfoot Global LLC., a company that offers Bigfoot expeditions. Whitton and Dyer are working with Bigfoot hunter, Tom Biscardi, and Biscardi’s Searching for Bigfoot, Inc., to present and conduct the scientific study of the evidence and information on this body. A few weeks ago, Whitton and Dyer announced the finding of the body on the “Squatch Detective” radio show, an internet based radio show hosted by Steve Kulls. While on that show, the commentator asked Rick Dyer “Would you allow one of our people to come down and verify the body?” Dyer replied, “The only person we would allow to come down and verify the body was ‘the real Bigfoot Hunter,’ Tom Biscardi.” The next day, the producer of the Squatch Detective show contacted Biscardi with pertinent information on how to contact Dyer and Whitton. Extensive scientific studies will be done on the body by a team of scientists including a molecular biologist, an anthropologist, a paleontologist and other scientists over the next few months at an undisclosed location. The studies will be carefully documented and the findings will be released to the world, according to Biscardi. Biscardi is known as “the real Bigfoot Hunter” because of his extensive investigations out in the field. He has been searching for Bigfoot since 1971 and over the past several years, he has been criss-crossing the United States and Canada tracking down the hottest leads on Bigfoot sightings. Videography on the studies will be done under the supervision of Scott Davis, an independent producer and owner of TV Biz Productions in Phoenix, Arizona. Currently, Tom Biscardi and his Searching for Bigfoot Team, in conjunction with Bigfoot Global LLC., are preparing to capture another of these creatures alive. That expedition will start very soon. The dates and the locations are being kept confidential. Last year, a film that Biscardi produced about his investigations, called “Bigfoot Lives,” won first place in the Documentary category at the Pocono Mountains Film Festival. Biscardi also hosts a Bigfoot oriented internet radio show that can be heard on Wednesday nights from 7:00pm to 8:00pm PDT at www.bigfootliveradioshow.com. The show is heard in over thirty countries. Searching for Bigfoot, Inc. has exclusive rights to all publishing rights, photo rights, television and film rights, production and distribution rights and other commercial opportunities related to the discovery and findings regarding this body and these creatures. Interested parties may contact Searching for Bigfoot, Inc., in writing, at their mailing address, 1134 Crane St., Suite 216, Menlo Park, California 94025. In the most exciting Bigfoot news to come along in a while, photos of the recently found dead Bigfoot creature have been posted online and a press conference to go over DNA and photo evidence are scheduled for this Friday, August 15th. Check out the link http://www.inquisitr.com/2357/has-bigfoot-been-found/ which shows the photos and the time and other pertinent info regarding the press conference. The photos have a rather tall, hairy creature in what looks to be some sort of freezer. Again, the BfRLC will monitor this event and report as we know more info. Keep on checking in...and make sure to follow our news ticker as it will have up to the minute news regarding this hot story. Matthew Whitton and Rick Dyer, Georgia residents who lead Bigfoot-tracking expeditions, say they found the body of what appears to be a Bigfoot in the woods of northern Georgia and will join local Bigfoot researcher Tom Biscardi at a news conference, according to Robert Barrows, who is publicizing the event. "I think you'll find that this is the real deal," Barrows said of the alleged discovery. The Bigfoot Researchers Lunch Club will be keeping close tabs on this story as it develops. As of yet, no body has been produced, nor has the group let the public know where the body is being kept. This could very well be it! Stay tuned to the BfRLC for up to the minute information. The animal -- a legendary, hairy hominid that supposedly lives in remote forests -- is said to be dead, frozen, and "shocking." Matthew Whitton, a 28-year-old, who has been with the department for six years, and Rick Dyer, a 31-year-old former correctional officer, posted a video on youtube.com, last week, claiming to have the male Bigfoot corpse. On their web site Whitton and Dyer announced an alleged discovery: "We have located a family of Bigfoot, and besides the clear photos and video, we have something even more shocking, a BODY." The Clayton County Police Department responded to the news with an official statement giving the department some distance. "That's his own personal business," said Police Chief Jeff Turner. "That has nothing to do with the business of the Clayton County Police Department. As long as he's not engaged in any type of illegal activity, his business is his business." Turner said it is against department policy for any officer to represent himself or herself online, as an officer or anything other than an individual, private citizen, and said he does not know that Whitton has violated that policy. Whitton is currently on leave, recovering from a gunshot wound to his left hand during a response to a Stockbridge armed robbery earlier this month. The people who believe in Bigfoot and are searching for evidence responded to the announcement with a mixture of disbelief, ridicule and hope. The Bigfoot Field Research Organization, a California-based group claiming there have been 61 Bigfoot sightings in Georgia, officially described Whitton and Dyer as "idiots" and "clowns," and warned their claims are a scam to advertise their business. Tal H. Branco, an Arkansas man who writes a regular column about Bigfoot research, said a lot of Bigfoot people think the whole thing's a hoax, but a lot of people are hoping, too, that they do have a Bigfoot body. "Maybe Whitton did obtain the hard evidence required to solve one of the world's greatest mysteries," Branco said. "It is apparently being promoted by a police officer that has everything to lose as far as his profession is concerned, if it is a game, a hoax or just a joke. On the other hand, if it is true, and the Bigfoot body is in his custody ... his decision to announce it on an Internet web site before the body was examined by an expert certainly indicates a lack of good judgment." In one video, posted online by "RDYER678," Whitton and Dyer interview a "pathologist" who is shocked at the Bigfoot, but then, in a follow-up video, the pair admits the "doctor of pathology" is actually Whitton's brother. Standing in a kitchen, Whitton's brother says to the camera, "Live and let live. What happened to that? Guys just trying to have a little fun, you know?" Dyer said the claims are not a prank, though, and not just an attempt to have fun. Reached on his cell phone Tuesday, he insisted the body is real and will be unveiled on Sept. 1 on the web site. "Why would we jeopardize Matt's job? Why would we risk the embarrassment of the backlash that we would get? We just have a lot to lose if this is a hoax ... I thought Bigfoot trackers and hunters were ridiculous and I made fun of them, to be honest, and I still do. They know nothing as fact. We do," Dyer said. Dyer said the Internet announcement and the obvious lie were meant to draw detractors and "build hype." Other Bigfoot researchers were dismissed by Dyer, and he said he and Whitton are the best trackers because they "have a body." He said the animal is about eight-feet tall, and about equal to the size of "three silverbacks," adult male gorillas, and nothing like the reported descriptions in the books. "I've never seen anything like this," he said. "It's a lot more than animal." Dyer did not say how they came into possession of the carcass, and declined to let a news reporter look at it, but swore it was being well-preserved and would be revealed. Dyer said he and Whitton plan to sell the Bigfoot body and make a lot of money. "As of right now," he said, "we've been offered a million bucks for it, from a very credible source. But we'll make 10 times that. This will change history forever."